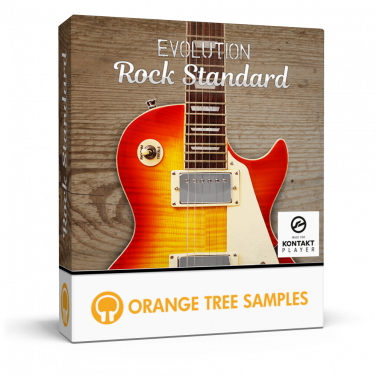 Evolution Rock Standard extensively reproduces the sound of an iconic electric guitar that holds a central role in the history of rock music. These guitars have continued in popularity through the decades, featuring in countless landmark recordings and performances. The level of craftsmanship involved in the production of these electric guitars is audible though their sonic depth and rich, singing sustain. Its dual humbucker pickups provide bold mid frequencies, supplying ample presence for crunchy and high-gain tones as well as generous warmth for clean tones. All this has been captured in exceptional detail--multiple dynamics, round-robin variations, all the articulations required to create production-ready rock guitar rhythm and lead tracks. In developing Evolution Rock Standard, we’ve teamed up with Rosewood Recording Company, one of Utah's most venerable recording studios. Guy Randle, the owner and recording engineer at Rosewood Recording Company, incorporates analog audio equipment to skillfully sculpt and emphasize the rich tonal qualities of the guitar. For the sampling session, Guy Randle brought in the versatile and accomplished guitarist Michael Dowdle. 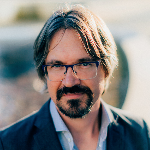 Michael Dowdle’s impressive musical history includes recording for artists such as Marie Osmond, The Osmond Brothers, John Schneider, David Archuleta, and The Jets as well performing on numerous movie and TV scores. He has also played on stage with artists like Brian Wilson of the Beach Boys, The Coasters, Sam Cardon, and countless others. 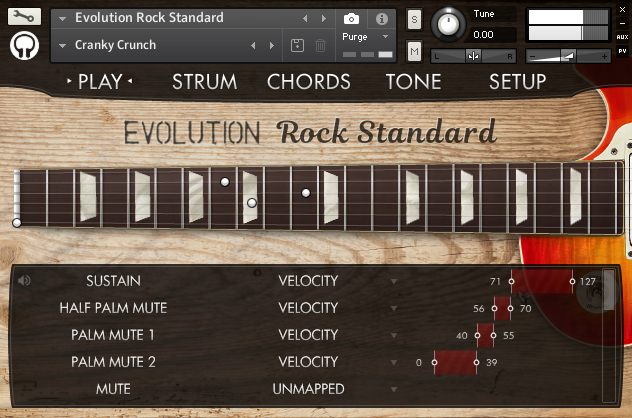 Evolution Rock Standard is outfitted with our Evolution guitar engine which provides you with a wealth of appointments: an innovative strumming pattern editor, automatic chord detection, and a robust effects engine. The library includes many factory presets for ready-to-use classic and modern rock guitar tones that fit right into the mix. - Built-in effects engine for instantly-usable blues guitar tones. - 13.4 GB (compressed to 4.51 GB using the lossless NCW audio format) of 24-bit samples. - Articulations such as sustains, palm mutes, mutes, natural harmonics, plus special effects like string slaps, divebombs, and more. 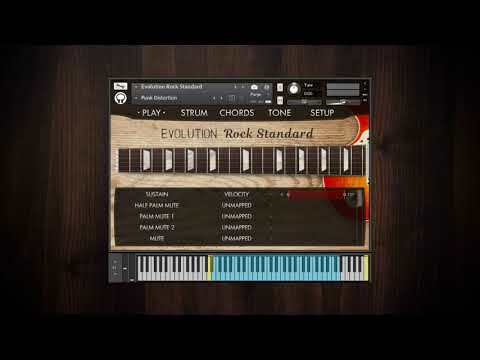 Evolution Rock Standard licenses Native Instruments' Kontakt Player sampler software. Consequently, owning the full version of Kontakt is not necessary, and Evolution Rock Standard operates without limitations within the free Kontakt Player application/plugin. This also allows the sample library to be listed in the libraries tab in Kontakt for convenient access. Evolution Rock Standard is NKS-ready. The integration with the Native Kontrol Standard presents many benefits, both when using the library in the Komplete Kontrol software as well as in conjunction with Komplete Kontrol hardware, such as the Komplete Kontrol S-Series keyboards and Maschine. 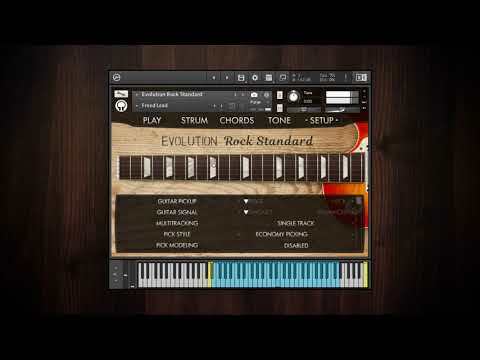 In addition to Evolution Rock Standard being displayed in the Native Browser among your other Komplete Kontrol instruments, there are a variety of other benefits. For example, thanks to Native Instruments’ Native Map® technology, you can control the library’s various parameters directly through connected hardware right out of the box. Furthermore, the keyswitches and key ranges are shown using Light Guide, an innovative technology that displays the key colors directly on your Komplete Kontrol S-Series keyboard. We recommend using Evolution Rock Standard with a Komplete Kontrol S-Series keyboard for the full experience. While not a requirement, you will be able to take advantage of the Native Kontrol Standard for an intuitive connection between software instruments and hardware. This product requires a total of 12.57 GB of free disk space in order to download and install the sample library. The total size of the download is 6.33 GB, and after installed the library occupies 6.24 GB.